Is your bathroom sink putting a “drain” on you and your routine? Don’t want to spend a lot of money on a plumber? 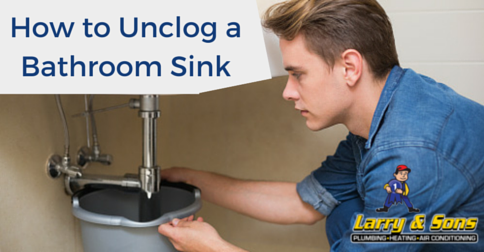 Depending on the seriousness of your drain, you’ll be able to fix most sink clogs in fifteen minutes or less. For bathroom sinks with stoppers, we’ve found that the stopper is often the cause of the clog. The pop-up stopper creates a perfect obstruction area for hair and other material to get trapped. Clean out everything underneath your sink so that you can access the piping area. Place a container underneath the piping. After everything is clear for you to work, you’re going to need to disconnect the pop-up stopper mechanism. Let’s take a look! Before getting underneath the sink, raise the stopper lever fully so that the stopper is all the way closed and sealed. Underneath the sink, behind the main pipe running from your sink, you can see where the pop-up stopper mechanism is connected. It is a horizontal pivot rod that is connected to the clevis strap (has many holes in it for height adjustments). Disconnect the metal arm (or clevis strap) by bending the small piece of metal (spring clip) holding it in place. The spring clip keeps the clevis strap in place and allows you to adjust the height of your stopper mechanism. After freeing the pivot rod from the clevis strap, you can loosen the pivot rod from the pipe with your hand. If you can’t do it by hand, then a pair of pliers should do the trick. 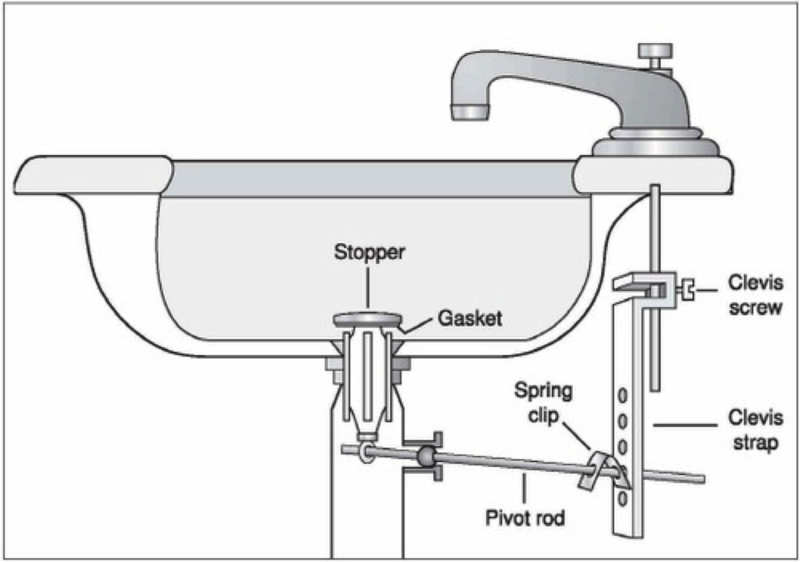 Stick a pan/bucket/tupperware underneath the pipes so that when you unscrew the pivot rod with the ball seal at the end (hidden in the pipe area) water will fall into your container and not all over the cabinet/floor. After disconnecting the pivot rod, the plastic pop-up stopper should be free to pull out, allowing you to pull it up and out of the sink. But before you pull the stopper out, put on your rubber gloves, because it is about to get gross. Don’t say I didn’t warn you. Pull the stopper out and clean it off in a different sink. Do NOT turn on the sink you are unclogging! Clean all parts with rubbing alcohol or a bleach solution. Put the clean stopper aside as you grab your metal hanger and bend it into a hook shape. Get deep inside the pipe with the hanger and pull out as much gunk as you can. You can use an old toothbrush to clean the sides of the pipe. You might also be able to pull some hair gunk through the hole where you took the pivot rod from. If you think that there is a clog in the P-bend of the pipe, you can go ahead and unscrew the P-bend and clear out any obstructions that might be there; however, simply cleaning out the stopper will fix most bathroom sink clogs. You can also remove the P-bend if you prefer to remove the clog down through the pipe instead of up and out through the sink bowl. Put everything back together again. After reassembling all of the pieces, while you are down there, inspect everything for leaks and corrosion. If you notice a problem much bigger than a mere sink stopper clog, call Larry & Sons at (301) 733-5428! If you are looking for a versatile, natural, and economical drain cleaner solution, we recommend using Bio-Clean. A combination of bacteria and enzymes work together to break down and digest materials in your drains and pipes. Call us for more information! Don’t forget to check out our maintenance plan; we provide fall and spring HVAC tune-ups, provide 15 % off all repairs, and much more! Follow us on Facebook, Twitter, and Google+ for more useful information and how-to’s.